HTC smartphone growth forecast dumbed down for Q1 2013? Were new devices cut too? HTC has several well-received smartphones on sale right now, but it's reportedly revising its projected growth and reducing the number of new phones in development for Q1 2013. The Taiwanese manufacturer's year-over-year gains for the upcoming quarter are estimated to be 10-15 percent, not the originally forecast 20-30 percent, sources told DigiTimes. 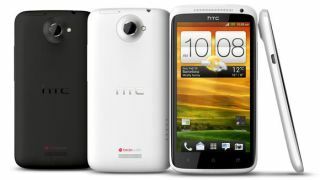 The launch of Apple's iPhone 5 and Samsung's Galaxy S3 are said to be one of the reasons for HTC's slower than expected outlook, according to the industry sources. The decline of smartphone prices in China are also said to be a contributing factor for the sluggish growth. With a mix of Android and Windows Phone 8 devices on the market, HTC is currently offering solid hardware, despite this disappointing report. Its smartphone lineup includes the "recommended" HTC One X+, the HTC Droid DNA, and the HTC Windows Phone 8S. The number of new devices from the company may be smaller than its product roadmap laid out at one time, however. Joining the slowdown in shipments of existing HTC phones, new smartphone models for the 2013 are also supposed to be suspended, claimed the report. Apple and Samsung are the real winners here. Combined, the two companies are said to have eaten up 106 percent of the smartphone profits. HTC is also losing money to Apple directly due to a 10-year licensing agreement over patent disputes. Apple is reportedly earning up to $8 (UK£5.03, AUD$7.67) for every smartphone that HTC sells, according to analysts. HTC has denied that the licensing fee is that high, but it is still losing money to its smartphone competitors, both directly and indirectly.